Cotton fabric is made from a natural plant fiber and is widely used in clothes and table linens for everything from delicate baby onesies to denim blue jeans. The fibers can be woven or knit to produce comfortable, breathable fabrics. Cotton clothes are affordable and durable but should be handled correctly to keep them looking their best and lasting for years. One hundred percent cotton fabrics are washable. 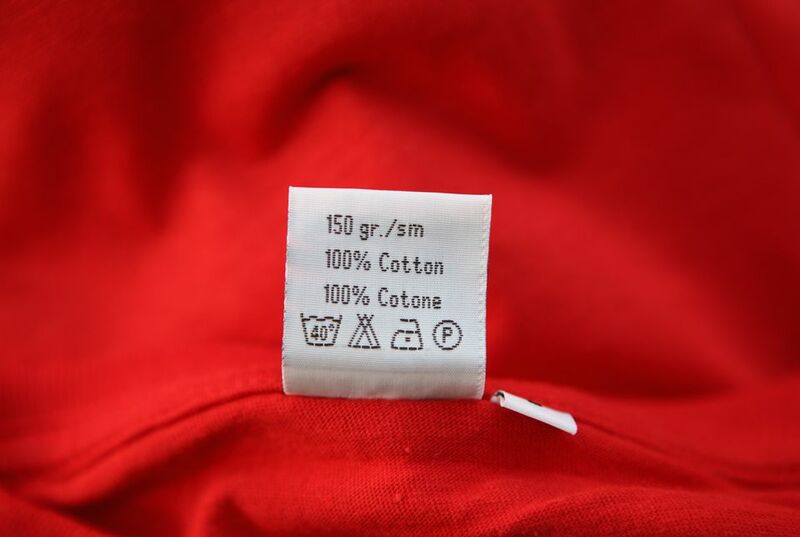 However, always check the care labels in garments before tossing clothes in the washer. While cotton is washable, some clothes or accessories may have materials that provide structure and shape― like interfacings in structured jackets and blazers―that are not washable. So, if you are a novice at doing laundry and see a dry clean only tag, pay attention. As you gain more experience, you may find that some "dry clean only" items can actually be hand washed. As with any type of fabric, treat stains on cotton clothes as quickly as possible following stain removal guidelines to avoid permanent staining. Fibers in garments each react differently when treated with stain removal products and during laundering. When using a stain removal product for the first time on colored cotton fabrics - especially dark colors and khaki, test it on an inside seam or hem to make sure the garment is colorfast. High temperatures―like hot water washing or high dryer temperatures - are not friendly to cotton and can cause cotton fibers to shrink. The amount of shrinkage depends upon the weave of the fabric and how the fabric was finished and sized at the textile plant. You can't change the fabric finish but you can make the best choices to prevent excessive size changes. Cotton fibers will relax and stretch during wearing. So, unless the cotton garment is worn close to the body - like underwear or sleeping attire―warm or cold water is the best washing temperature to prevent shrinkage and stretching. Cooler water temperatures will also help prevent fading of bright or darker colors. There are exceptions to the cooler temperature rule. Bed linens, bath, and kitchen towels should be washed in hot water to remove bacteria, body soil and fluids. This is especially important if someone in the household is ill, very young, very old or has a weakened immune system. While many people use chlorine bleach to whiten white cotton clothes, cotton fibers can actually be weakened by chlorine bleach. Undiluted chlorine bleach should never be applied directly to the fibers and can cause holes. Dilute solutions can be used safely on cotton or cellulosic fibers for stain removal and whitening. However, even dilute solutions will weaken fibers causing them to rip and wear out if used too often. A better option for whitening and brightening white and colored cotton fabrics is to use an oxygen-based bleach (brand names are: OxiClean, Nellie's All Natural Oxygen Brightener, or OXO Brite). Overdrying not only causes some cotton clothes to shrink, but it also causes excessive wrinkling. Select the permanent press setting for cotton clothes or use a lower dryer temperature setting. Most cotton fabric needs very little ironing if the clothes removed from the dryer while slightly damp. Hang clothes to finish drying to prevent excessive wrinkles. Should Cotton Clothes be Dry Cleaned? If you have dark cotton jeans, slacks or blazers that you want to keep from fading, dry cleaning is a good option. A professional cleaner will know how to handle the fabric properly. Or, you can use a home dry cleaning kit to freshen dark cottons and extend the life of the dyed fabric. Some cotton fabrics wrinkle excessively when washed and will require ironing. Use a medium hot iron and always iron on the wrong side of the fabric. For extra protection, use a pressing cloth between the iron and the rayon fabric. Extremely high temperatures when ironing can scorch cellulosic fibers. The scorching or yellowing occurs as the fibers begin to burn. Burned rayon fibers cannot be revived. You can also use a clothes steamer or hang cotton clothes in a steamy bathroom to help remove wrinkling. This will not give you a crisp finish but will remove big wrinkles. Our guide provides seven laundry secrets you didn't know you needed. Get it free when you sign up for our newsletter.